Love, Exes And Ohs – The Perfect Oh!!!! I don’t know if Violet Duke can give us a perfect ‘OH’ than the story of Isaac and Xoey. Her Cactus Creek series is a romantic cauldron of some amazing characters, lovable, warm, just plain perfect with imperfections. They grow on you, they tempt you with chocolate and beer, they protect you with their might, they support you unconditionally and they give the readers the perfect Ohs!!!! Xoey Montenegro and Isaac McKnight have a long history between them before they decided to remain best friends. They talk every night, they have breakfast together everyday, they talk about their misfit dates, analyze every single thing under the sky, except talk about the feelings they have for each other. It’s perfectly clear to Isaac that Xoey is ‘the woman’ for him, whereas Xoey has a history that holds her back from accepting Mr. Wrong as her Mr. Right. 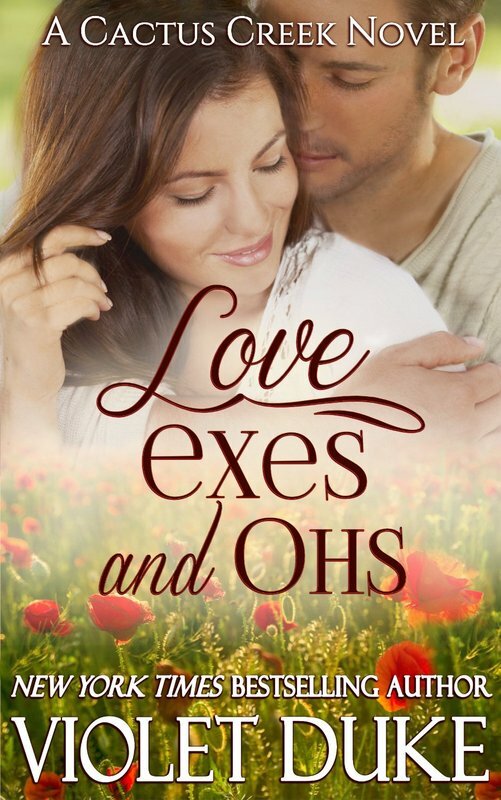 “Loves, Exes And Ohs” is just not another sweet romance with a happy ending. It is loaded with emotions and pain, love and friendship, and a history with a twist that would rock our hearts, yet at the same time leaves us feeling warm and fuzzy. Xoey is a darling with a heart of gold and everyone just loves her. Strong and resilient, she is open with her feelings and kindness. Smart, sassy and beautiful inside out, she has a past that she needs to reconcile with before she can give herself completely to Isaac. And Isaac the perfect Oh for Xoey is the perfect complement to her wit and charm. Supported by his good friends including the new ‘dwarfs’ who have made a home in Cactus Creek and have appointed themselves as Xoey’s unrelated siblings, Isaac has the daunting task of convincing Xoey that he is her Mr. Right forever, despite the past that connects him with Xoey. Violet Duke as always is one of the most charming writers I’ve come across. Her penchant for narrating stories that tug at your heart, creating characters that you can absolutely relate on a daily basis, and the moments of tender emotions that ties your heart into knots, I can guarantee will make her one of your favorite to go writers. Be it with her witty dialogues, the warm and friendly conversations, or the unsuspecting twists she weaves into her story, you will always end up with the biggest ‘OH’!!!! Received an ARC from the author for an honest review. « Incriminating Evidence – A Fascinating Thriller!